We are passionate about the slow fashion movement. We design and make with thought and care and we are delighted that our customers share our ethos. Slow fashion focuses on the choices we make about our wardrobe, particularly how and where our clothes our made. Choosing good quality clothes means better pay for skilled workers, a smaller impact on our world’s resources and a better product for the customer. 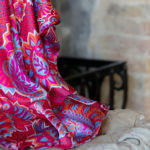 So we are very proud that our luxurious silk pyjamas and robes, silk chemises and camisoles and tunics are all printed and made by expert artisans in England. And our customers can be proud of that too. But it’s important to make your wardrobe work for you. Choosing clothes that can be either lounge, day, evening or night means that with only a little styling imagination, they will earn their place in your wardrobe. Our chemises and camisoles are the obvious choice to wear under the robe. They offer sheer pleasure that cannot be beaten for an evening at home but another day can be worn under a casual jacket. The amazing feeling of silk against the skin somehow feels wicked during the day. Just take our elegant, flat fronted Indigo silk pyjama trousers and silk shorts. They both go beautifully with the Lotus Silk Tunic and Lotus Silk Robe but make them double up as evening wear and you’ll get to wear them twice as much. We’ve gone all out for silk satin and velvet this winter putting Rick Owens’ Mastodon Velvet wrap top with our flat front silk trousers. Jimmy Choo’s Lucy Leopard print flats are perfect and don’t forget to add a loud pop of colour. Rosantica’s Atena fringed bracelet is bang on. I love silk shorts in the evening with a tailored jacket- smart and sassy. 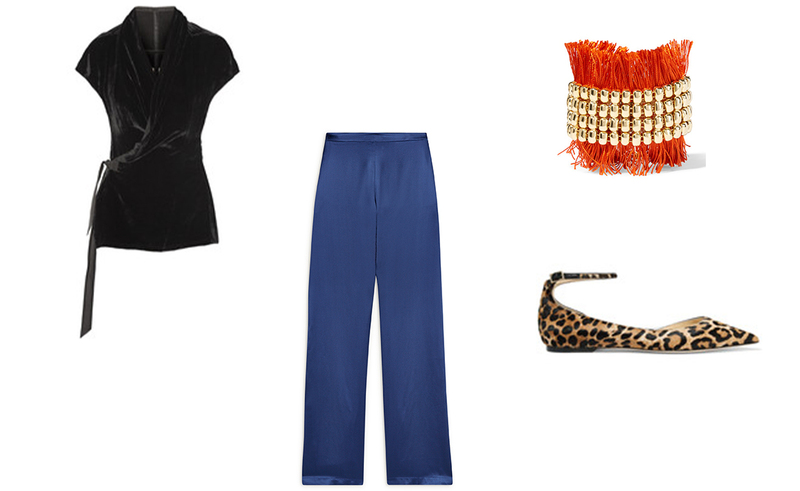 You’re not going to get a better one than this season’s satin-trimmed velvet blazer by Tom Ford. A good heel will keep the look sharp- we love the Alaia Suede ankle boot. If you’re feeling flush, finish it all off with Annoushka’s divine Butterfly necklace. « Wearing silk, reclining with a cocktail, what could be better?